I hear those sleigh bells ringing… | Damian Trasler's Secret Blog - Do Not Read! 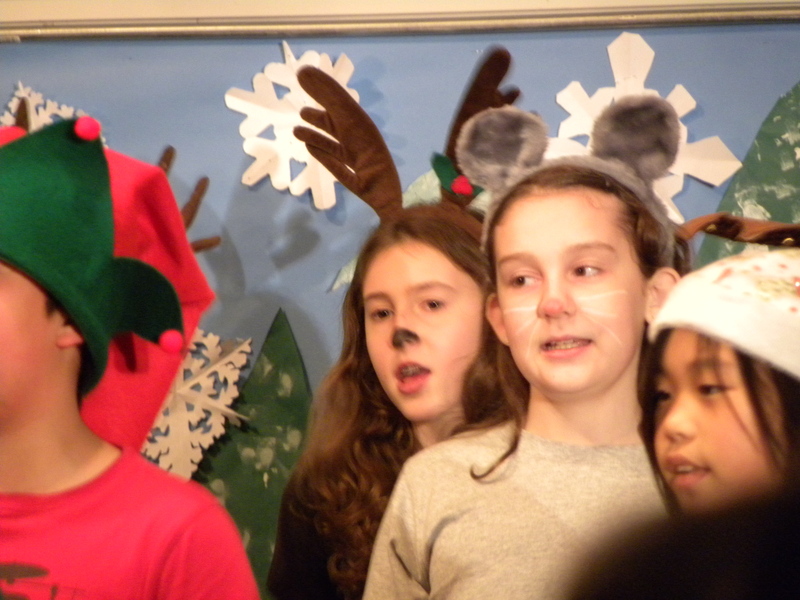 ← The house I grew up in…..
Eldest Weasel makes a Rockin' reindeer in the school production of "North Pole Musical"
For many people here in the Greater Vancouver area, Christmas has been coming since Hallowe’en bowed out on November the first. Folks round this way really seem to enjoy decorating their houses, so barely had the month changed before the giant spiders’ webs and inflatable Frankensteins were being pulled down and replaced with miles and miles of twinkling strings of lights and inflatable snowmen and Santas. Since the World’s Largest Home Improvement Retailer skipped straight over Hallowe’en and started flogging Christmas decos way back in mid-October, I was a little jaded about the whole thing, but recently Mrs Dim and I have taken the odd stroll out along our neighbourhood of an evening, and I have to say I’m charmed. Yes, by UK standards, I suppose the houses look a little gaudy, and there’s an austerity measures voice in my head that mutters about the electricity bill all these people must have to pay in January, but look, it’s PRETTY, ok? If the lights are going up and the evenings are drawing in, then the weasels must be performing in the school play, right? I fear so, but this being Vancouver, the multi-cultural melting pot of the most laid-back country in the Northern Hemisphere, we won’t risk anything as controversial as tea-towel wearing re-enactments of the Nativity. Nope, last year’s fiesta was a play that stressed the Seven Habits of Highly Effective People (a common theme for the school that year) and this year we had the North Pole Musical, where the inhabitants of Santa’s workshops competed to see who would get to perform in the musical. 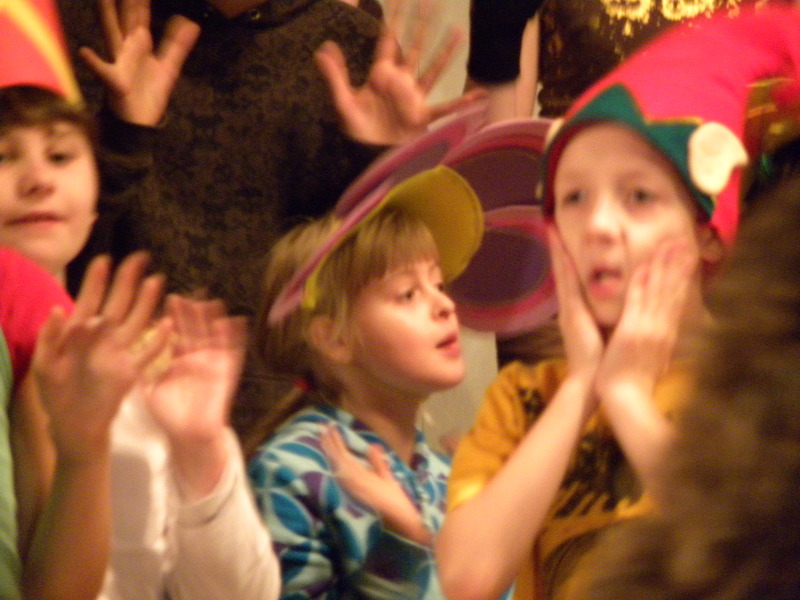 This year the performance was by the elder two age groups in the school, so the singing was more tuneful and there was less “Ahh, doesn’t he look lovely?” from the watching parents. As always, I was torn between enjoying the show and wishing I had written something for them. At the climax of the piece, Santa, Mrs Claus and Crystal Snowflake sing a song about the heart of Christmas, which seems to be about, you know, peace and love, and hope and generally nice but vague concepts. Because, you know, it’s Christmas. A time for presents, and…stuff. I can appreciate that not everyone at the weasels’ school wants to celebrate Christmas as a Christian festival, but recently we (being TLC Creative) were asked to consider writing a secular piece for a schools Christmas show. I was hesitant, because I dread getting to that moment when one of the characters steps forward to talk about the true meaning of Christmas. I’m sorry, but if you’re atheist, agnostic or of another religion (all of which are fine by me, go right ahead…) then there is no true meaning of Christmas for you. Just as Eid, Ramadan and Diwali mean nothing at all to me. I won’t stop you celebrating them, and if you ask me to come along and hold up a lantern in a Diwali celebration, why I’d love to. Sounds like a neighbourly thing to do. But does it mean anything to me? Nope. So just as I wouldn’t write a secular play on the true meaning of Diwali being what draws a group of street kids to reform their thieving ways and become teachers, I don’t feel comfortable writing about the True Spirit of Christmas being to give out presents and be nice to people you don’t like the rest of the year. This feeling comes round every year and it makes Mrs Dim cross because she has always worked in a multi-faith, multi-cultural environment, whereas for most of my working life I’ve been in a dark room, staring at the computer screen, so she knows it’s not about the True Meaning of Christmas, it’s about making people take part in Christmas when they don’t want to. People of other beliefs have no option about Christmas, she says patiently every year, the whole place (UK, Canada, wherever) closes over the holiday and some people don’t want to celebrate Christmas. Saying “Happy Holidays” may set your teeth on edge, Mr Grumpy, but it doesn’t offend. So let me apologise. I know a fair few atheists, agnostics, and folks who just find the whole “Them and Us”ness of religion too much bother. Fair play to you, not going to convert you. You are not a rugby ball, as I point out in one of my plays. But please, let me wish you a Merry Christmas, with no ill intent, no offense meant. I hope it brings a little light into the darkest time of the year, even if it’s only from the strings of lights around your tree. This entry was posted in Emigrating with Weasels and tagged Canada, Christmas, decorations, Diwali, Eid, Hallowe'en, lights, Mrs Dim, Play writing, Ramadan, School Christmas play, UK, weasels. Bookmark the permalink.